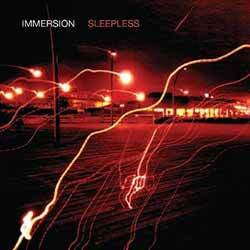 Sleepless is Immersion’s latest album, a suite of ten (49 min, 45 sec) distinctive, unpredictable instrumentals. It follows 2016’s Analogue Creatures Living on An Island. Analogue synths are at the heart of Immersion’s sound, with the addition of guitars, drums and bass to round out the tracks. The LP is a timeless, laid back affair which washes over the listener. The first play through you'll be intrigued, with subsequent listens providing a familiar, comfortable experience. Depending on your mood over time each track will present its own merits. Personal favourites, though, include the hypnotic opener 'Microclimate', the '80s arcade game inspiration behind 'Propulsoid'; and the haunting 'Seeing is Believing'.